I used to love watching Hill Street Blues on a late Friday or Saturday night during the '80s. My favourite part was the pre-credits when Sergeant Phil uttered that phrase as all the officers were dashing out after the 5.30am roll call: "Hey, Let's be careful out there." Nowadays that phrase has so much more meaning, especially when riding around London. It's more like London Cyclist Street Blues - even tragedies. Although the number of cycling accidents and fatalities in London is down compared to to 4 or 5 years ago, there is still no room for complacency. Thirteen cyclists were killed in road traffic accidents (RTAs) in London last year - nine of them involved heavy goods vehicles (HGVs). So far this year four cyclists have been killed on London's roads. All of them involved HGVs. Last month was particularly tragic when two cyclists were killed within the space of a week - one at Old Street, and the other at Elephant and Castle. There was a horrible story of a guy taking part on a cycling forum reading about how a serious accident had occurred in West London. He later discovered that it was his girlfriend who was the fatality. 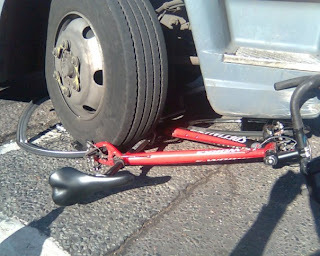 That's how my club-mate's bicycle ended up when a lorry suddenly turned across his path. Miraculously he had the reflexes to literally jump off his bike and save his skin. He's now nursing a badly cut leg and a very bruised ankle. Another club mate of mine is also recovering after being knocked off her bike while on her way to work. What's happening to our cyclists in London? The statistics show that the majority of fatal accidents are as a result of cyclists being crushed by HGVs while turning left. The drivers failed to see the cyclist that was on the inside lane to them. Various organisations including the CTC (UK's national cycling body), and the London Cycling Campaign have launched awareness campaigns so that HGV drivers pay special attention to cyclists. These organisations recommend the use of improved safety mirrors on lorries. There are also various cycle training courses for people who wish to commute by bicycle. Furthermore, Mayor Boris Johnson (who is a cyclist) has put forward a proposal to the Department for Transport, for a pilot scheme in which cyclists are allowed to turn left at a red light provided there are no pedestrians crossing. This is a fairly contentious proposal, though in a way I can see his logic. By cyclists getting a head start from the lights, this will avoid the risk of being hit by other heavier vehicles moving off at the same time. The idea needs to be properly thought through though, as that will also increase the risk of being hit by other vehicles that have right of way in the cross-wise lanes. Anyway, whatever measures are put in place it is ultimately still going to be down to ourselves as cyclists to be alert and keep our eyes and ears open to all that's around us at all times. And hey, hey, hey - Let's be very careful out there.